Be sincere and accept all the responsibility of your behavior. 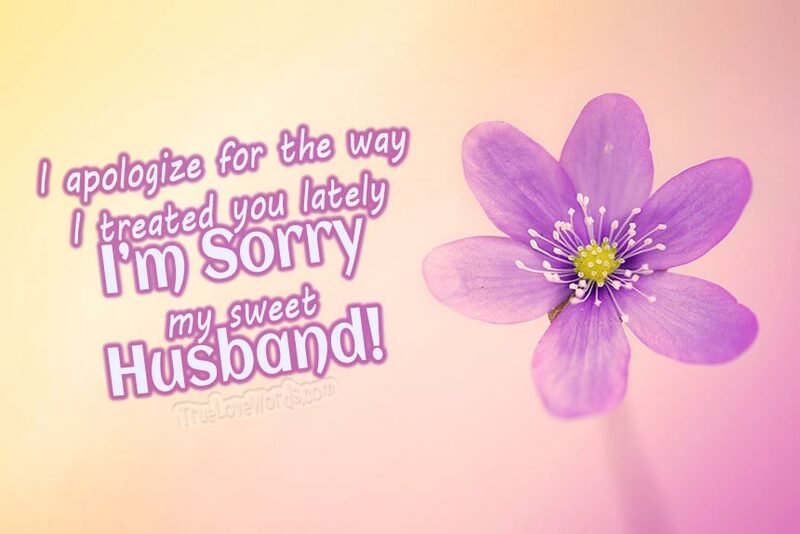 If you regret it and you want to make everything alright as it was before, don’t be afraid, and make the first step by sending an apology sorry message to your husband. Find below many sorry messages for your husband that suit on any occasion. – My charming husband, you don’t deserve the treatment I gave you, and I am genuinely sorry. – I don’t want to be the kind of wife I have been to you lately, so I am doing some deep soul searching to find ways to treat you better. – Please forgive my foolish behavior. You are the best husband, and I regret the way I treated you. – Seeing the pain in your eyes when I said those horrible words broke my heart. I can never take them back, but I promise you will never hear them from me again, my dear sweet husband. – I know it will be hard to forgive the behavior you’ve seen from me lately, but I pray that you’ll try, and I promise to change my actions. Marrying you was the best thing I ever did. – When pride gets in the way, it can be hard to move, and I apologize for letting it take control of me, dear husband. – My inconsiderate actions were uncalled for. Please accept my apologies and let me make it up to you. – Please accept this big, heartfelt sorry wrapped in kisses and hugs and sealed with a few tears for the hurt I caused you, my sweet hubby. – I vow to be the loving and giving wife you deserve from this moment on. I’m sorry Dear! – I never want to stop being your wife. I promise to change the things I do that hurt you and think about your feelings. – I apologize for the way I treated you lately. I’m Sorry my sweet Husband! – I realize now that my perspective may not be the truth, and I promise to work harder at seeing things from your point of view. I never want to lose you, precious husband. – I tried to write an apology note, but it kept falling apart from the sogginess caused by my tears. I can never fully explain just how sorry I am, but I hope you’ll give me another chance. – My careless and demanding ways are not becoming of the person who is blessed to be your wife. Please give me a chance to make things right. – I miss your handsome face hovering over mine and coming in for that special goodnight kiss. Please let me make everything up to you. – My rudeness was unacceptable, and I want you to know that I am mortified by my behavior. You deserve better, and I will follow your example of good behavior, dear husband. – My selfishness has rocked the boat in our little stream, and I’m hoping that my apology will bring smooth sailing and sunny skies back to our marriage. – I feel sorry for embarrassing you in front of our friends. I have apologized to them, and now I’m asking for you to let me make amends to you. – I know my sorry sound like a broken record lately, sweet hubby. Please know that I’m working hard to get my act together. – My husband, I’m hoping that this apology will be the beginning of our path to healing. I miss you so much and long for things to be right between us. – No woman has ever been more blessed to call you, husband. Please don’t let my deplorable behavior overshadow the beautiful days we’ve had, and hopefully, there will be many more to look forward to. – I know this apology can’t compensate for the way I made you feel, but I hope that it will be a start. I need you back in my life. You are the only man for me. – I hope that this apology will be the remedy for your broken heart. I love you more every day, and I’m sorry for hurting you, sweet husband of mine. – May my confession of all the wrong attitudes and disgusting behavior I’ve displayed lately soften your sweetheart toward me, my husband. I promise to make things better. – To repair your heart, I created a love potion for you, hubby. It’s one heartful of apology and three handfuls of love, with a sprinkling of heartfelt hugs and kisses. I hope you enjoy it. – When my hubby’s not happy, I’m not happy either. I’m sorry for hurting your feelings. – Hurting the man I love has left me feeling empty and ashamed. I have no excuse for my behavior, but I hope you will forgive my carelessness. – I could never take your forgiveness for granted. 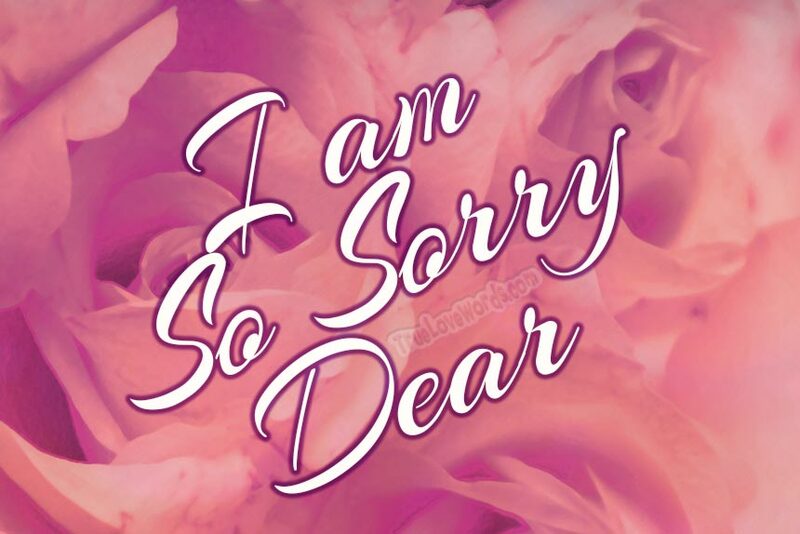 Will you please accept my sincerest apology for mistreating you, my wonderful husband? – I take full responsibility for what has happened between us, and I vow to make everything up to you. – I’m a mess without you, hubby. Can we please kiss and make up? – You’ve kissed away my tears many times, and if you let me, I’d like to do that for you. I’m so sorry for the way I hurt you, my beloved husband. – It feels like all the sorrow of a lifetime has been rolled into one big fight. Can you ever forgive me for what I did? You’re my precious husband, and I love you more than you’ll ever know. – I’m not perfect, but I can certainly be a better wife than you’ve had lately. Please let me give it another try. – I know your soul is suffering because of me. Please know that I love you deeply, more than on our wedding day, and I’m doing everything I can to be sure I never hurt you like that again. – May this apology be like a soft blanket for you, hubby. Wrap yourself in its warmth and feel the softness of my heart as I make things right with you. I’m sorry!